As promised, here is information about the final exam I have created for my first-year seminar. As I mentioned in my previous two posts in this series, my goal is to make students more aware of what is now often referred to as “design thinking”: in this course, they are not just learning how to build games, but to solve problems. Incorporated the principles of the “golden rule” and “magic circle” in relation to events in the real world. Utilized elements of conflict and cooperation. Had clear written and unwritten rules. Use information from assigned course readings to support your argument. Be sure to include references to your sources in your essay to avoid plagiarism – this applies whether you are using direct quotations or just the ideas of another author. Use parenthetical in-text citations as with reading responses to save space. An essay with few or no relevant references to the course readings will suffer a reduction in grade. The essay should be double-spaced, in 11 or 12 point font, and the equivalent of 3-4 pages long. There is no need for a separate bibliography or title page; please do not include them. Work independently; do not discuss your essay with other students. 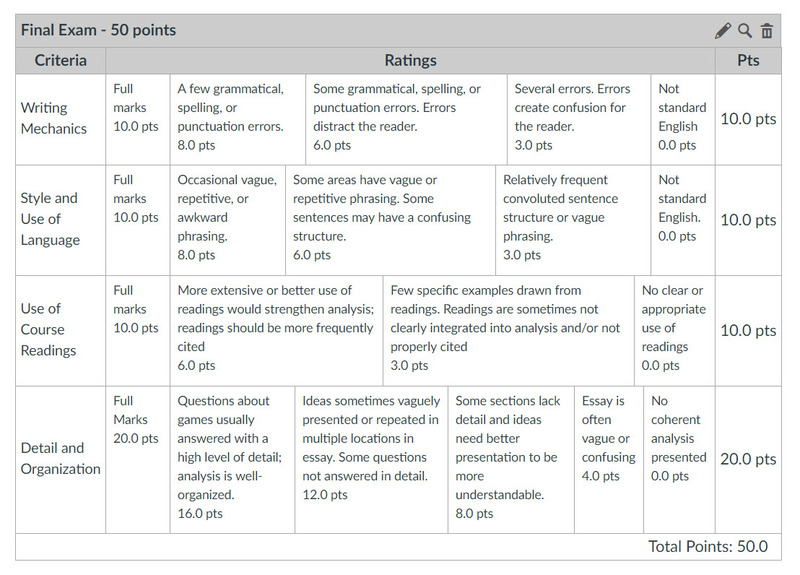 A screenshot of the rubric I’ll be using to grade the exams is below. As I mentioned about the game design beta test rubric, I am not really concerned with the exam scores generated by the rubric — my primary goal is getting students to become more aware of how their experiences translate into learning.